Long considered to be terminally un-hip, string machines are on the brink of a revival. Will Gforce's VSM advance their rehabilitation? Sometimes the best ideas are the least complex. 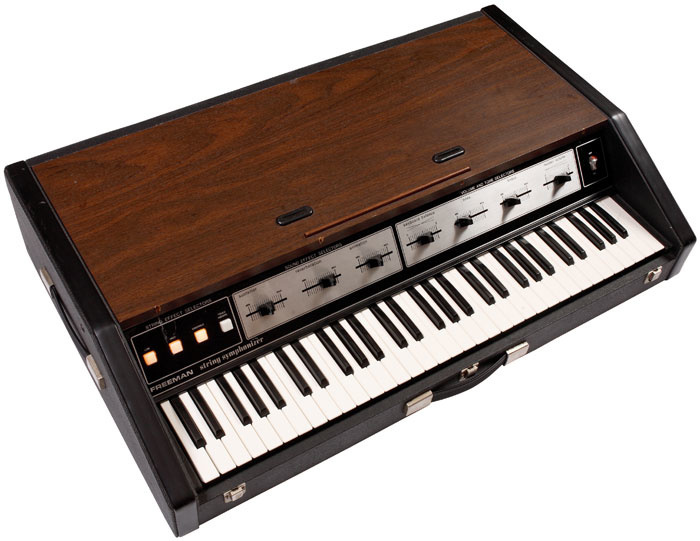 Nearly eight years ago Gforce were well on the money with their M-Tron plug-in, an honest recreation of the mighty Mellotron whose simplicity and immediate appeal hit the nail bang on the head with no fuss and no nonsense. Once again, GForce aim their hammer with unerring accuracy in realising Virtual String Machine, a plug-in virtual instrument that was virtually screaming out to be created. Yes, the string machine is back with a vengeance — only this time without the chipped veneers, the torn Tolex coverings or the aroma of contact adhesive and chipboard. VSM comes crammed with 17 of the most iconic machines from the past 40 years, as well as a few surprises — and, best of all, there's not a single oxidised key contact in earshot! Considered the ultimate in 'cheese' until recently, string machines are now recognised not only as a valuable part of our keyboard heritage, but as frequently great-sounding instruments. One can only wonder how Camel might have sounded without an RS202, or Jean Michel Jarre without an Eminent 310, or the Enid without a Solina. There is so much timeless music whose character was shaped, or even defined, by a string machine of some sort. VSM's meticulously sampled collection of classic and sometimes hyper-rare vintage string synths is contained within a custom player whose feature set is highly sympathetic to the string machine genre. While Gforce could have added a whole raft of synthesis excesses, they have opted instead for a commendably restrained blend of simplicity and flexibility. At the same time, they have mercifully freed some machines from the constraints of their original design, (see the 'On String Synths Generally' Box), extending their functions and allowing them luxuries found on more sophisticated instruments. VSM has a dual-layer structure, whereby up to two string synths can be loaded into the Upper ('A') and/or Lower ('B') areas. Essentially, VSM behaves like two independent basic polysynths running in parallel, although of course you can simply load just one instrument into a single layer and ignore the second layer if you wish. Each layer can be edited independently of the other; in between and to the right of the red and green loading fields are three buttons: 'A', 'B' and 'Link'. Click on 'A', and all the 'independent' controls glow red (for Layer A.) Subsequent edits apply only to Layer A. Unsurprisingly, clicking on 'B' edits only Layer B, and the controls glow green accordingly. To edit both layers identically, click on Link; the controls glow a pleasing warp-drive blue, and both layers receive the same adjustments. VSM's controls are based on straightforward subtractive synthesis, yet provide plenty of scope for tailoring the sounds. Firstly we have coarse tuning (plus or minus 12 semitones), fine tuning, pan and level for each layer. In order to let you easily appraise the changes made to each layer, a pair of mutually exclusive solo buttons for 'A' and 'B' are provided. The filter section offers a choice of low-pass, band-pass and high-pass four-pole filters with resonance control. Possibly in keeping with the string machine philosophy, the filter is deliberately designed not to self-oscillate at high resonance settings. The signal then passes through two ADSR envelope shapers, one for filter and one for amplitude. Measuring the maximum time taken to complete an attack, decay or release envelope cycle showed a figure somewhere around 24 seconds — more than enough for the most languid of ambient dreamscapes. A filter envelope amount slider additionally controls the depth of filter sweep produced by the filter ADSR. String machines are traditionally not velocity sensitive, but in VSM they can be, via two knobs controlling velocity response for both filter and amplifier. Providing further atypical string machine behaviour is a knob governing the filter cutoff frequency's response to keyboard aftertouch. Lastly amongst the synth parameters, an LFO with speed and depth control can be used to add pitch vibrato to each layer. This is very useful when layering sounds that do not have any inherent ensemble effect (for example Freeman Strings 1 with Roland RS202 Strings 1), creating faux-ensemble textures. While some may find it surprising that there's no LFO filter modulation in VSM, this was a conscious decision made by the designers, who believe it to be outside the remit of the instrument. If you really miss this facility, however, its effect can easily be contrived using MIDI controllers, as we'll see in a moment. Split keyboard effects can be achieved using the key-range sliders directly above the graphical keyboard — just select the 'A' or 'B' layer and drag the handles at each end of the strip to specify the key ranges of each layer. VSM's parameters can be controlled via MIDI, as one might expect. Control assignments are made by the familiar 'MIDI learn' method, and controllers can be directed to the parameters of either or both layers. Clicking the partially shaded 'MIDI CC' button at the top left of the keyboard superimposes green and red rectangles upon the layer-independent (synth) parameters and grey rectangles over the global (effects and master) parameters. Clicking inside a rectangle and moving a physical controller makes the assignment, showing the controller number in white. Single controllers can affect multiple parameters, allowing for radical sound changes with just one knob or fader move. Curiously, MIDI controller assignments are not saved along with patches, which might be an inconvenience for anyone using the stand-alone version of VSM in a live situation. Any MIDI assigments you make apply globally to the VSM stand-alone, and those settings are restored the next time you run the program. When VSM is hosted in a DAW, the MIDI assignments of each instance are saved along with a song, and return as you left them when the song is reloaded. VSM's effects act upon the total sound output by both layers. Gforce's choice of effects are highly appropriate to the string machine ethic, and of course no effect could be more apt in this context than a phaser. VSM's phaser is a superb example, evoking a wonderfully 1970s vibe. The six- or 12-stage phasing options provide three or six sweeping notch filters respectively, with speed, depth, centre frequency, resonance and mix controls. Speed can be sync'ed to your track's tempo or left free-running. VSM's simple and intuitive MIDI editing in action.The Ensemble section adds thickness and movement that sounds similar to the multi-voice bucket-brigade chorus typical of old string machines, offering a choice of two, four, six or eight chorus voices. This effect presents a wide stereo soundfield, due to each voice having its own fixed pan setting. The ensemble voices are freely mixable with the dry sound, and can also be detuned against each other, providing anything from subtle chorusing to heavy mal de mer. As an alternative means of widening the stereo field, the 'Wide' button applies a tiny delay to the right audio channel, making use of a psychoacoustic phenomenon known as the Haas Effect. Its effectiveness is dependent on several factors — for example the layers' initial pan positions, the ensemble effect amount, and even the frequency characteristics of the samples used. It is therefore most apparent when used on centrally panned sounds that have little or none of VSM's own ensemble effect. "We recorded everything via an RME Fireface 800 interface and Metric Halo converter. The sample length is variable; very rarely less than about eight seconds but often a lot more — anything up to 22 seconds, if my memory serves me correctly. We tried really hard to sample full oscillator cycles, to ensure the cleanest looping. The sample rate is 44.1kHz and the bit depth is 16. Any more than that would have been overkill for instruments with limited bandwidth by default." Some of the instruments featured in VSM. Clockwise (from top left): Freeman String Symphonizer, Eminent 310, Roland RS202, Crumar Multiman.Each machine has every note of all its major sound variations sampled over a 49-note range, with and without its ensemble effect where appropriate. The RS202, for example, has six variations — Strings 1 and 2, each with no ensemble, Ensemble 1 and Ensemble 2 settings. There are 66 sound sets altogether, comprising over 3000 individually looped samples. 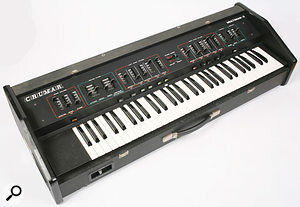 VSM soundsets are mapped across a 49-note range because most string synths had four-octave, C-to-C keyboards, although this was not always the case. 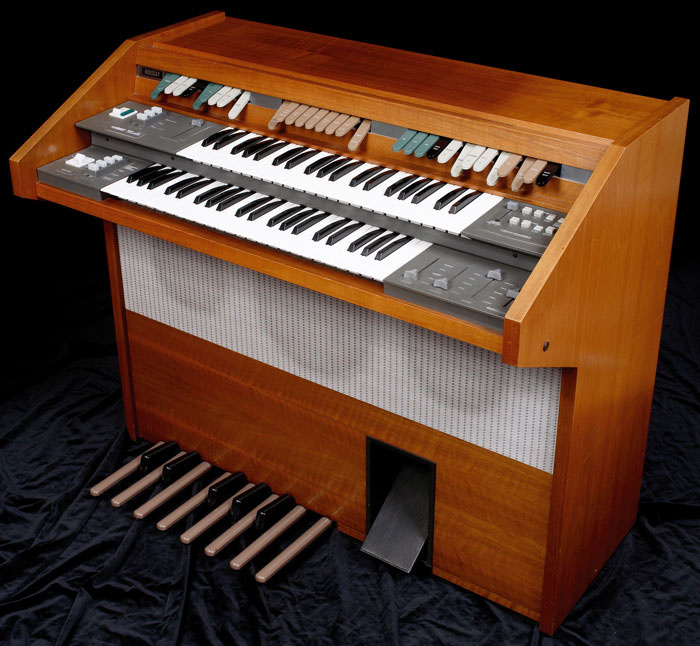 The Elka Rhapsody 610's five-octave keyboard, for example, ran from 'F' to 'F' covering 61 notes (hence its name) and although represented in VSM by only 49 notes, is nevertheless a very welcome addition. The Cello sounds of the SS30 cover just the lower 25 notes, and this is consistent with its original range. Although the soundsets reflect the original key ranges, it is possible to stray outside these ranges — after a fashion — by detuning layers by up to an octave. I discovered some particularly dark, moody sounds by transposing down an octave, effectively slowing the samples' playback speed (and their inherent ensemble modulation cycles) by half. Admittedly that's straying from strict authenticity, but it doesn't half sound good! There are also a few surprise entries too — the Oberheim OB8, Oberheim Xpander and Polymoog. None of these technically count as string synths, yet their string sounds are undoubtedly worthy of inclusion. As if to demonstrate that even two ostensibly 'identical' string synths can sound markedly different, I was intrigued by VSM's Logan String Melody, which sounds radically different to my old Vox String Thing (its predecessor) and other Logans of my acquaintance. Whereas Logans are generally known for their lush smoothness, VSM's take on the Logan has a comparatively rough, gritty quality. Despite this, it's still a usable sound in a cool, grungey sort of way, making for some interesting blends with other instruments in the library. VSM includes a large selection of preset patches, ably demonstrating the software's sonic possibilities. These are arranged into 28 banks — one each for the 17 instruments, with the remaining banks each named after their guest programmer. There's even one provided by Ultravox's Billy Currie. A User bank is also provided for storing your own patches, which, I couldn't help noticing, are given a cheeky file extension that had me chuckling with mirth. No, I won't say what it is — you can discover it for yourself! Gforce are currently working on an expansion pack that we are promised should contain at least one mouth-watering surprise. There are still numerous contenders worthy of inclusion in the VSM virtual hall of fame — how about the Godwin String Concert, the Roland RS505, or one of my all-time favourites, the Elka Rhapsody 490? We'll just have to wait and see. Perhaps by way of acknowledgement that identical string synths don't necessarily sound the same, the forthcoming expansion is slated to include an 'alternative' Logan sample set more in keeping with that instrument's signature sound. The expansion pack is scheduled for release later this year. However much you appreciate an instrument, it's unusual not to form some sort of a feature wish-list. Here are some that come to my mind. Firstly, an option to make the envelopes paraphonic would enable brutally honest recreations of machines such as the Solina and ARP Omni II. Secondly, I'd like a two-pole filter option for more subtle tonal control. Thirdly, how about a filter key-tracking control to tonally balance the top and bottom ranges? And finally, a speed control for the ensemble effect would be great — sometimes you just want to make it go faster! Finally, VSM behaved without a murmur of complaint during the review period — apart from one issue experienced using VSM within Sonar 7. If playback of a sequenced VSM part is interrupted mid-note, the currently sounding notes 'hang'. The only way to stop them is to run your hand along the keyboard, sending individual note-off commands. Pressing Sonar's 'panic' button did not work — VSM seemingly doesn't recognise external 'all notes off' commands, at least not in Sonar 7. With virtual instruments becoming ever more labyrinthine and 'deep', it's almost a relief to find one that is refreshingly unencumbered by menus, wavetables, matrices or other quantum physics. VSM hits the nail squarely on the head, combining the immediacy of the original sampled instruments with some well-chosen sound-shaping tools that provide plenty of scope for creativity while still retaining the spirit of what string machines were all about. Whether you are a long-standing fan of string synths or an enthusiastic newcomer to the genre, it's hard to see how you could be disappointed with VSM. Considering that string machines are essentially based around the same concepts (one or more oscillators with frequency dividers, modulators and envelope shapers), it's remarkable how varied and distinctive the sound of one model can be from another. There are variations on this theme, however — the Freeman String Symphonizer and Yamaha SS30, for example, had twin oscillator banks that could be detuned against each other. Nevertheless, your typical string synth usually had little in the way of sound variation, which led them to be regarded as one-trick ponies. As more and more manufacturers joined the competition, introducing additional features and improvements to make their products more versatile and attractive, so our string machine heritage took shape. From the cheesiest wasp-in-a-jam-jar to the most luscious, gothic ensembles, there was something to suit every taste and price range. The most elementary models such as the Crumar Compactstrings and GEM Instastrings would merely provide switchable sound selections (violin, viola, cello or similar options) with some form of basic envelope control. If you were lucky, there would be faders to balance the various voices, and perhaps there would even be a tone control — usually to help smooth out the top end. More sophisticated machines would allow you to defeat the ensemble effect, or perhaps choose between two types of ensemble, whilst others included a vibrato effect that could be added to the sound. At the furthest end of the scale were more luxurious, expensive models that blurred the distinction between string machine and synthesizer, such as the Korg Trident and Crumar Trilogy, offering features such as additional waveforms, a separate bass section, a tacked-on polysynth with filter and ADSR envelope shaper, and maybe even a basic organ section; these are known as multi keyboards. Yet another subset of string synths is the paraphonic ensembles. The distinctive feature of paraphonics is that, rather than each note having independent attack and release envelopes, just one EG operates upon the whole sound, lending them a distinctive 'sucking' quality when played non-legato. 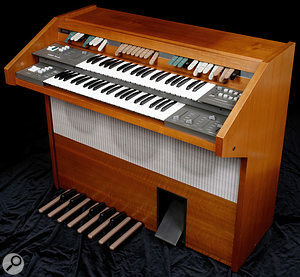 Examples of paraphonic ensembles include the Solina, the Logan Piano Strings Synthesizer and the ARP Omnis. It's undoubtedly a testimony to the quality of the Solina's sound that it came to be revered as the 'Rolls Royce' of string machines, despite being paraphonic. VSM is PC and Mac compatible, and runs in stand-alone mode or as a VST 2.0 and RTAS (both platforms,) or Audio Units (Universal Binary for both Power PC and Intel based Macs) plug-in. The sound library can be installed in your own location of choice, including external drives. When VSM is first run, you are prompted for the registration code supplied with the product. Sympathetic synthesis features and splendid effects take the sounds to new heights. MIDI control assignments not saved with presets. Notes hung in Sonar if sequencer playback was interrupted mid-note. Seventeen classic and rare vintage string machines in one sympathetically designed virtual instrument. If you like vintage string machines you'll be in seventh heaven with VSM. Period.